“In the summer of 2013, I studied abroad in Dublin, Ireland, at Dublin City University through the CIEE program. During my three-and-a-half weeks abroad, I was fortunate to experience both the city life and countryside of the Republic, as well as Belfast in Northern Ireland. I visited the breathtaking Cliffs of Mohr, St. Patrick’s Cathedral and famine memorials throughout the West of Ireland, just to name a few. Studying abroad was easily the best experience of my life and left me with more than just a newfound understanding of Ireland. I came home with great friends from all across the United States and more self- confidence as well as a sense of increased independence. Studying abroad changed my life and allowed me to grow in multiple ways.” — Courtney Mower ’15 was a Biochemistry major with a minor in Criminology. She was recognized as the Outstanding Student in Biochemistry at the 2015 Academic Achievement Awards. She was a member of the Alpha Lambda Delta Freshman Honor Society and the Sigma Xi Research Honor Society and participated in the TAS Research Honor Program for two years. Courtney studied in Dublin during the summer of 2013 and, in 2014 she received the Elaine Winshell Biochemistry Award and the Beck Endowed Scholarship. 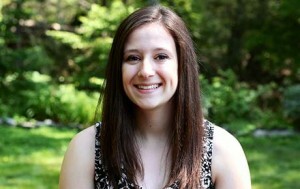 As a sophomore, Courtney joined the Relay for Life Planning Committee and was event chair for two years. Courtney is attending Arcadia University, Pennsylvania, for a Master of Science in Forensic Science.